The most famous dish of Imperial China is the Peking Duck from the capital city of Beijing. Since the imperial era, the Peking Roast Duck has been prepared, and today it is considered amongst the national foods of The People’s Republic of China. The dish is valued for the slender and crisp skin. It is served mainly with skin and less flesh, and sliced by the cook before the diners. Ducks for the preparation of the dish are specially bred and killed after 65 days. They are seasoned with salt, sauces, spices and sugar before being roasted in a hung or closed oven. The duck is enjoyed with spring onions, hoisin sauce and pancakes. Bianyifang and Quanjude are the two prominent restaurants in the capital city of Beijing that have been serving this delicacy for last 200 years, and subsequently are most revered restaurants in Beijing. 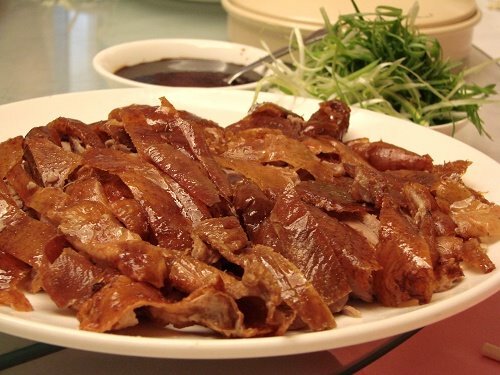 Ducks have been prepared in the country since the emergence of Northern and Southern Dynasties. A variation of the roasted duck was cooked for the Chinese Emperor during the commandership of Yuan Dynasty. This delicacy was christened Shaoyazi and mentioned in the year 1330 by the food inspector of the royal kitchen – Hu Sihui, in his manual of Complete Recipes for Dishes and Beverages. The expression was completely developed under the reign of Ming Dynasty and was amongst the chief dishes on the menu cards of the imperial court. Bianyifang was the very first restaurant specializing in the Peking Duck and was recognized in 1416 in Xianyukou, Beijing. During the reign of Qing Dynasty (1736–1796), the fame of the dish extended to the elite classes, inspiring scholars and poets who relished the delicacy. By the middle of the 20th century, Peking Roast Duck had gained nationwide recognition and developed into the national symbol of China. Since time immemorial Peking Duck has been the most appreciated delicacy by political leaders near and far. The delicacy has bagged the #1 spot on the favourite foods list of several American Presidents, Richard Nixon to name one, erstwhile German chancellor Helmut Kohl and Cuban activist Fidel Castro. The origins of the Peking Duck lies in Nanjing. Earlier the ducks were tiny with black feathers, and nested in the canals of the city’s main waterways. However, with the relocation of the Chinese capital to Beijing, and the increase of population and supplies in the area, ample amounts of grains were available to these birds and soon they grew bigger and developed white feathers. By the fifth dynasty, the Chinese farmers domesticated the fresh species of these ducks. Today, the delicacy is cooked from the Pekin duck. The newborns are reared for 45 days in no boundary environment, and later force fed four times everyday over a period of 20 days, resulting in the increment of the duck’s weight up to7 kg. Fattened ducks are slaughtered, disboweled, plucked and thoroughly rinsed with water. Air is blown through the neck to separate the fat from the skin. It is then soaked into a pot of boiling water for a brief period before hung dried. It is then glazed with maltose syrup and rinsed again before left to completely dry for the next 24 hours. Spices, salt and sugar is rubbed in, and finally it goes into the oven for roasting until it turns golden brown. In addition to the traditional cooking, chefs around the globe have devised unique recipes for preparing the Peking Duck and can be conveniently produced at home. Peking Duck is customarily sliced by the chef before the diners. The skin is served first, which is dished in garlic sauce and sugar. Next comes, the meat which is served with spring onions, sweet bean sauce and steamed pancakes. The whole duck can be ordered for takeaways and reheated at home in an oven, boiling oil or grill at varying temperatures and number of times. Bianyifang and Quanjude in particular share a long history of serving a high-quality of the delicacy, and today are brand names. Both of them have received global recognition and have been awarded in 1999 with the China Renowned Trademark.